Dr. Tager is a Board Certified Dermatologist. Dr. Tager joined Dr. Geffner at Accredited Dermatology in 1998 and was instrumental in expanding the practice throughout New Jersey. In 2012 the practice was acquired by DermOne. In August 2016, she and Dr. Geffner formed Certified Dermatology. Dr. Tager is an expert in medical and surgical dermatology for adult and pediatric patients. 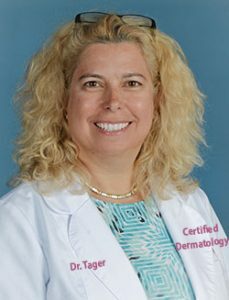 Dr. Tager earned her bachelor’s degree from Vassar College and her medical degree from the University of Miami Medical School. She completed her internship in internal medicine at Emory University Hospital and completed her dermatology residency at New York Medical College hospitals in Valhalla, New York. She is the busy mother of three children. Although she practices full time, she finds time to travel, attend the theatre and concerts and enjoy museums. Residency – New York Medical College hospitals in Valhalla, New York.